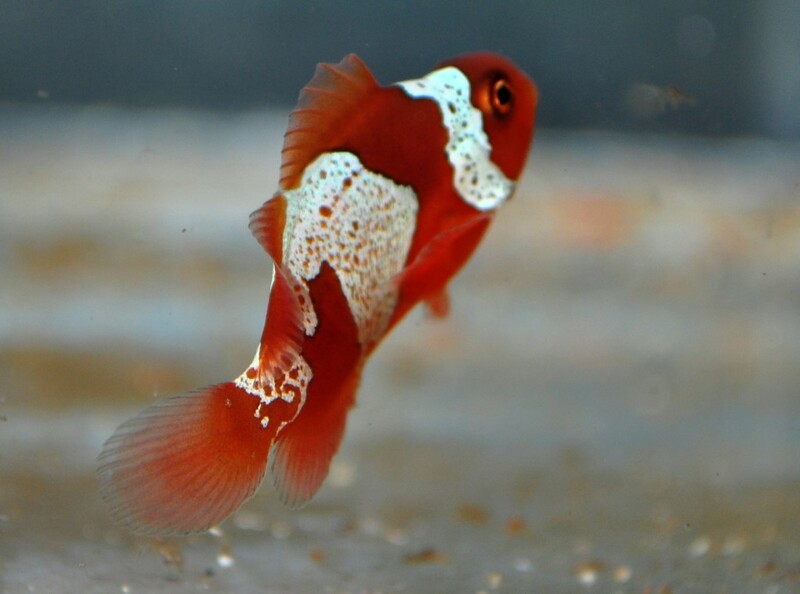 PNG fish are certainly taking center stage right now; between Lightning Maroon Clownfish babies, and the new introduction of sustainably-collected PNG fish from EcoAquariums PNG via UniqueCorals.com, there is no shortage of news on the PNG front. 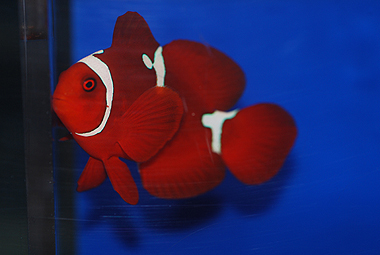 The speculation about what Lightning Maroon Clown offspring will sell for hasn’t abated, and to that end, I can still say that nothing has been decided. 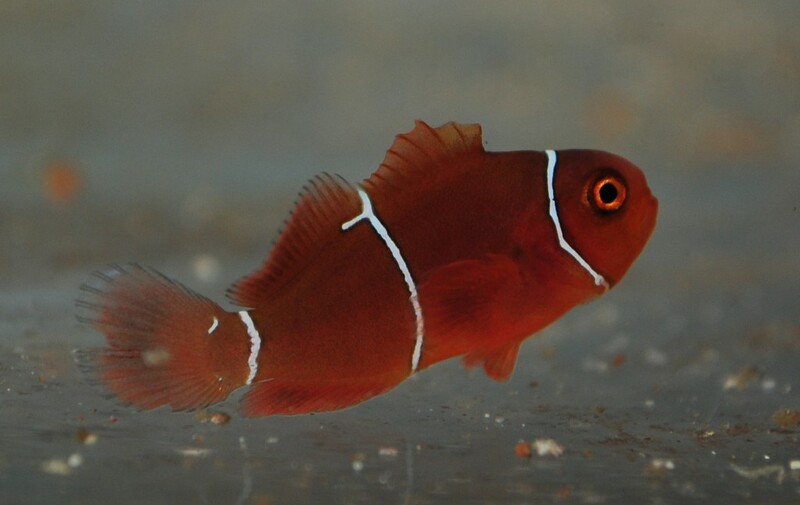 I did, however, contact Scott Fellman (of Unique Corals) and Dale Prichard (of Ecoreef UK) to ask how much it cost, at retail, to get one of Dan Navin’s wild-caught PNG White Stripe Maroons, as well as the unique “Horned” and other “Unique” versions that come out of PNG once in a while. What I found is that sustainability does carry a small premium, and by the same token, uniqueness carries it’s own premium pricetag as well. The part that people will find interesting is that these prices suggest a minimum or baseline starting point for what the non-Lightning offspring could go for. That said, it’s safe to assume that there will be additional value on these Lightning-Maroon siblings given the genetic dice-role involved. Dale Prichard is quick to point out that the UK market is smaller than the US market, as if to suggest that “demand” might be lower and thus, prices would be lower. Maybe, but on the flipside, Dale has been supplying retailers with PNG fish for several months now, so the UK may represent a more valid market to look at. 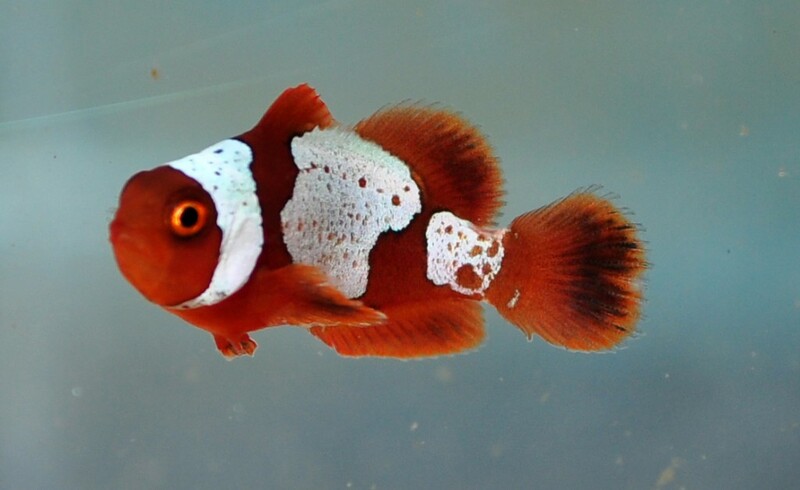 A small normal white stripe maroon from PNG would start retailing at £27; or roughly $45 USD based on recent exchange rates via the Google Currency Converter. That said, Dale relayed that more maroons retail around £40 / $63 USD. 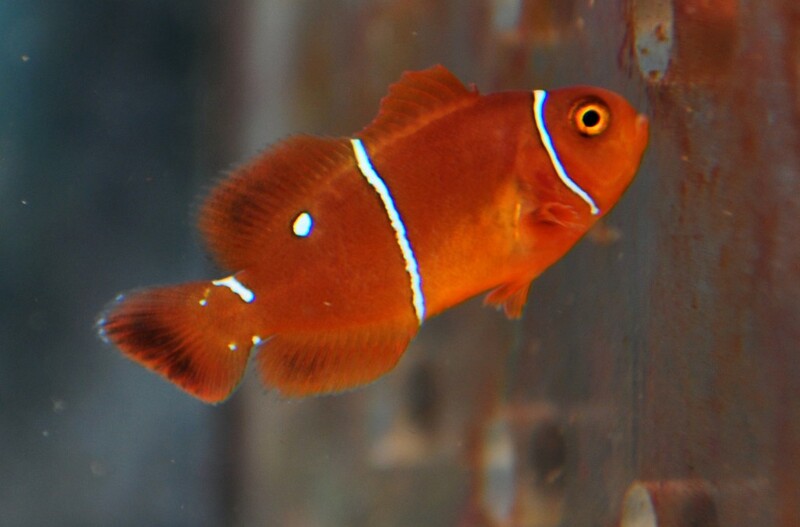 A “Horned” Maroon is really going to set you back; while the retail value may be placed at £80 / $126, the reality is that retailers are normally selling these special fish paired with normal white stripes. 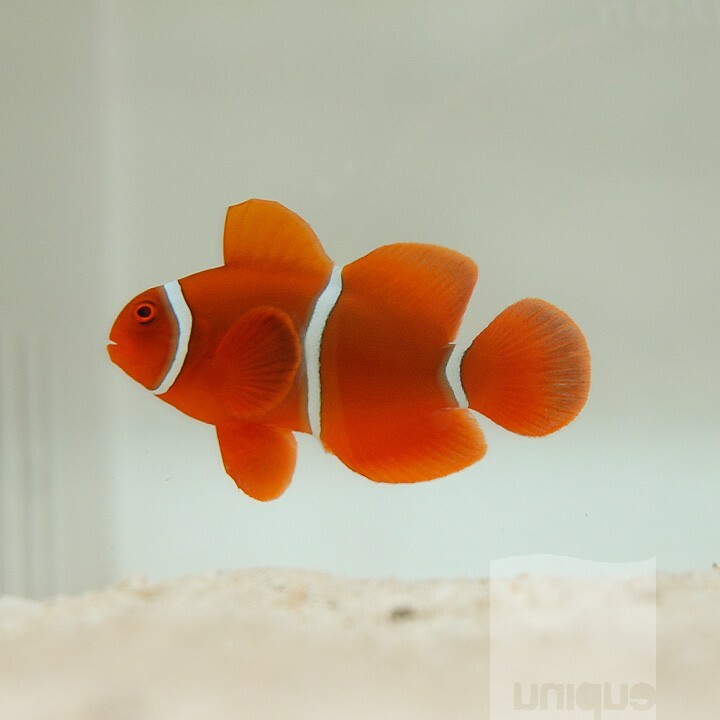 The net result is your more likely to spend £100 to £120, or $157 to $189 in order to have a PNG “Horned” Maroon Clownfish in your aquarium in the UK. 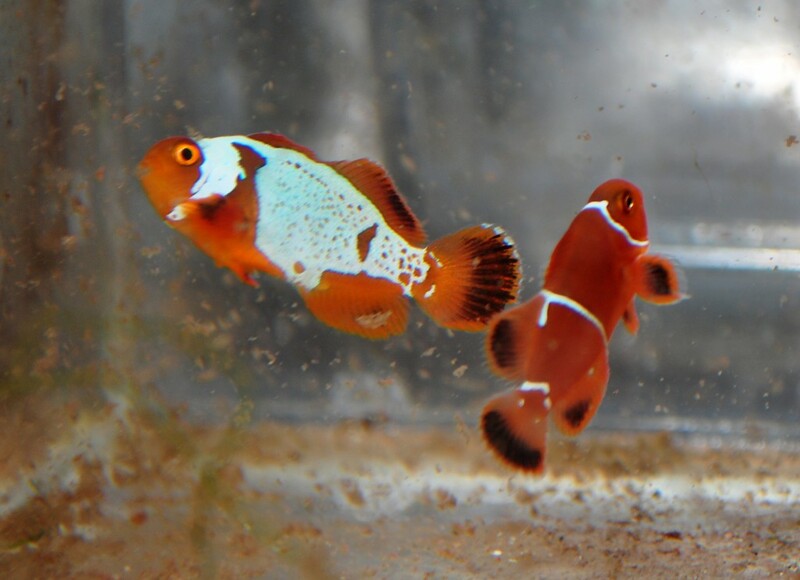 Here’s some examples of the fish Dale Prichard has been seeing come through the Ecoreef UK under his watch, some of which may have been held back for breeding efforts. 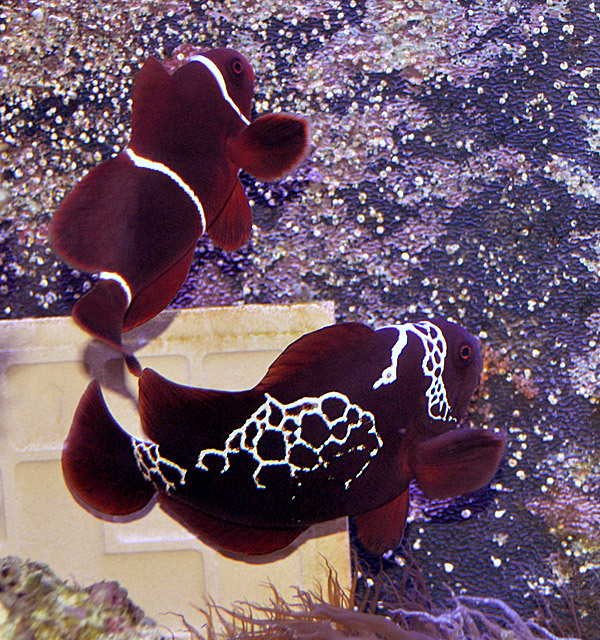 A uniquely-patterned Maroon from PNG? Expect to be paying in the neighborhood of $150-ish as a starting point, going up as the markings become more elaborate / intricate. 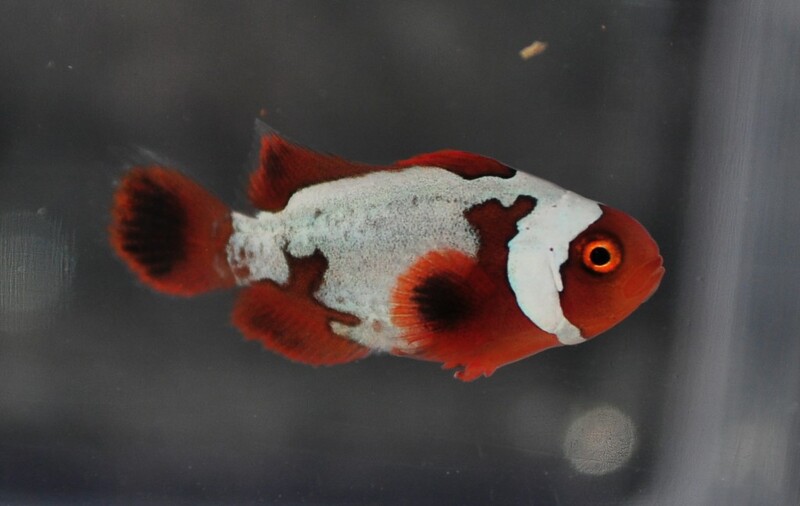 So realistically, an unusually-marked PNG Maroon with a White-Stripe mate from the only current US-source for wild-caught PNG fish, UniqueCorals.com, is easily going to set you back $200 to $450. On top of all this, PNG is always going to represent a potentially restricted supply; the government-set TACs (Total Allowable Catches), aka. 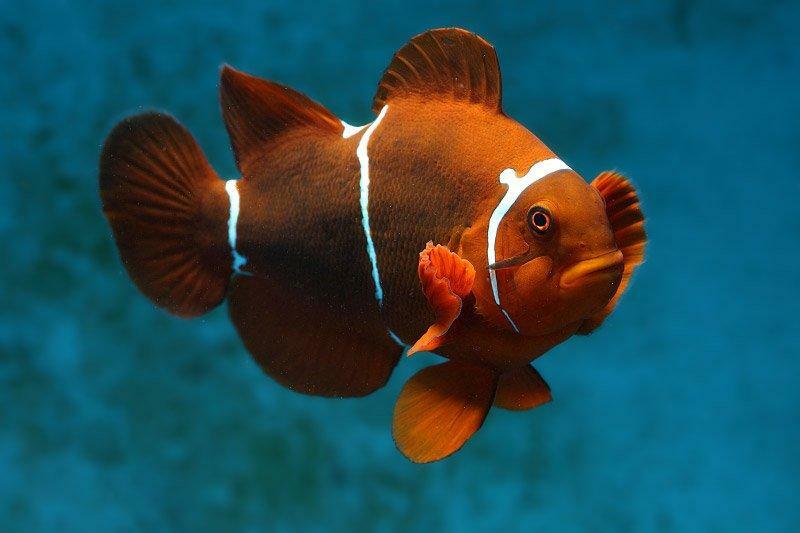 a “quota” in most fisheries, will automatically place a cap on the number of any species of fish that can be exported from PNG in a given timeframe. This number could further be restricted if updated surveys were to conclude that population numbers were dropping; this is almost textbook fisheries management 101 in my opinion. 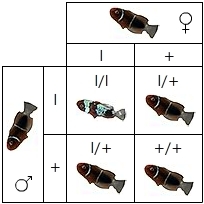 But apparently I’ve come to learn that this methodology, and the setting of any specific quota, is quite rare marine ornamental fisheries around the globe. 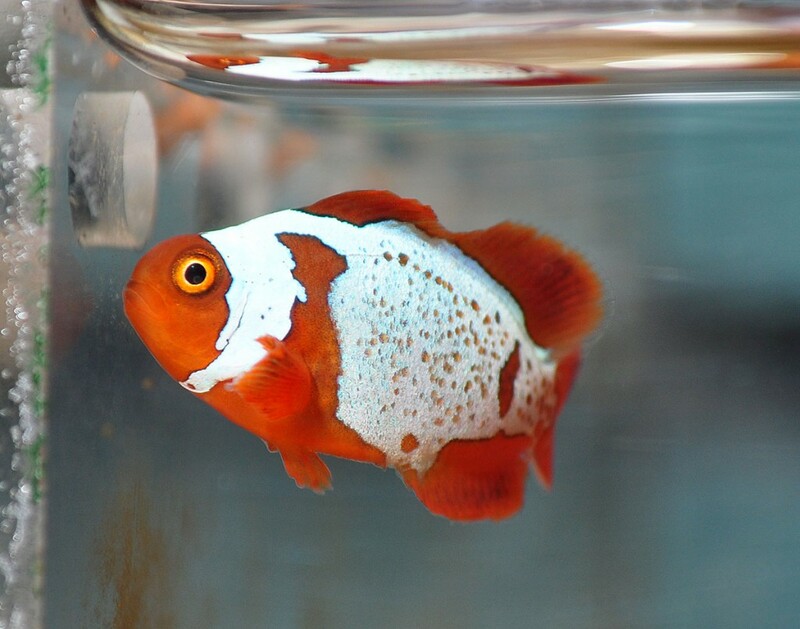 PNG fishes are more than just nice fish with a good back story and a limited supply; they might represent the current ideal in terms of broodstock for captive breeding efforts. 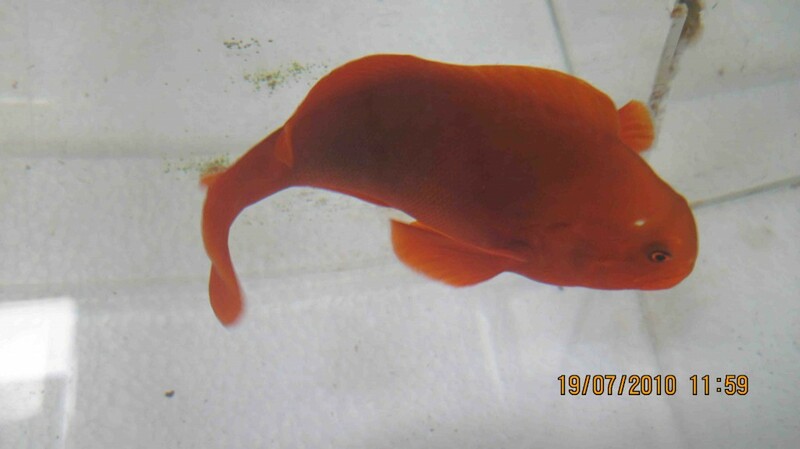 Indeed, as breeding moves forward, getting fish from good supply chains with known provenance should represent the bare minimum that a breeder uses in selection of wild stock for propagation. Eg. 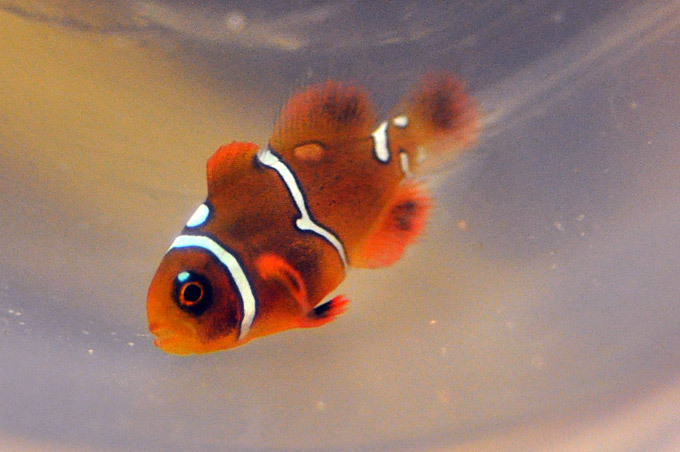 don’t just settle for any old clownfish; if you’re going to breed Pink Skunks, know if they came from the Marshall Islands, Fiji, Tonga, Vanuatu, Australia, or somewhere else! You never know when some taxonomist or geneticist is going to come along and say “hey, that Marshall Islands form of Pink Skunk is actually not the same species”…wouldn’t it be nice to know that you had that “new species” already breeding in your broodstock collection? 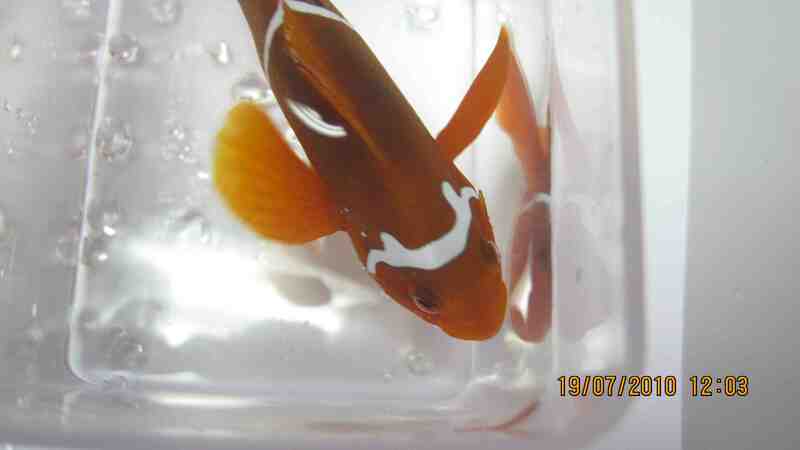 But getting back to PNG and “Horned” Maroons, remember that the EcoAquariums Ltd. fish aren’t just going to the UK, and now the US, but also to other Asian markets. Remember that there is an encounter rate only 1 unique maroon found every 11 days, or roughly 3 per month. If this represents ALL the fish available to the worldwide market from PNG, let’s just hypothetically give the UK, the US, and Asia equal weight. 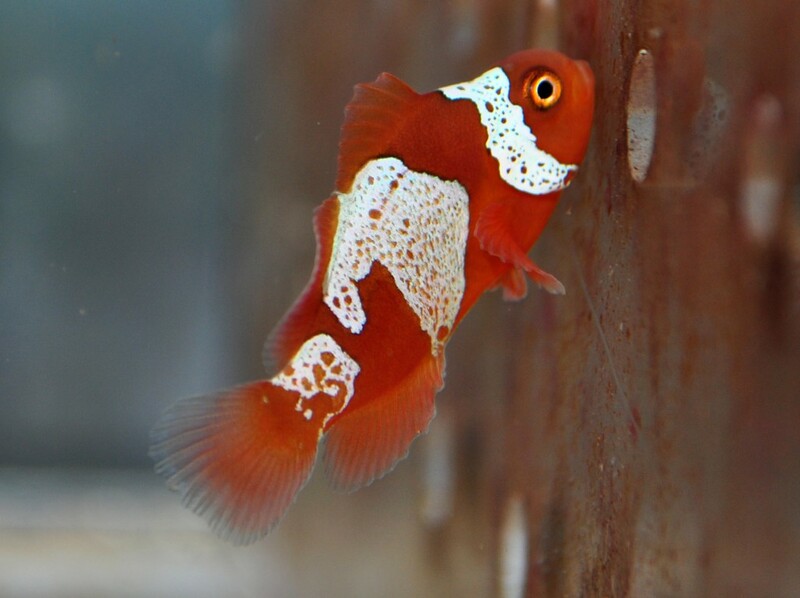 If the unique fish are divvied up equally, at best, we here in the US could expect to see roughly one “Horned” Maroon land here per month. Now, maybe there will be more collecting with the US market coming online, and that could offset some of this (eg. 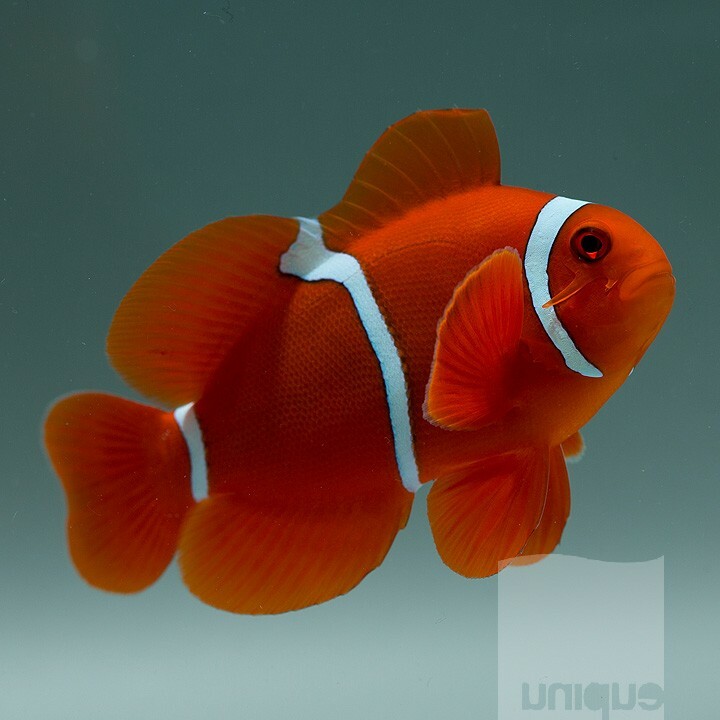 maybe the encounter rate for unique maroon clownfish will go up with more divers in the water looking for more fish to fill more demand), it’s hard to say. But given the track record to date, look at this this way – 12 of these might come into the country per year. Is $150 to $400 a fair price? 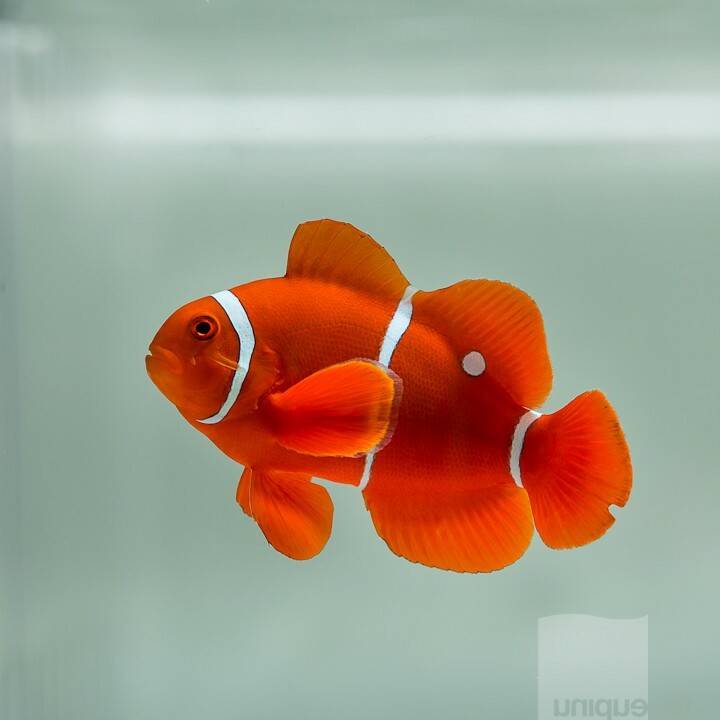 Well, the market decides that, but think about all the designer and hybrid clownfish being sold in the three digit range without consumers batting an eye? 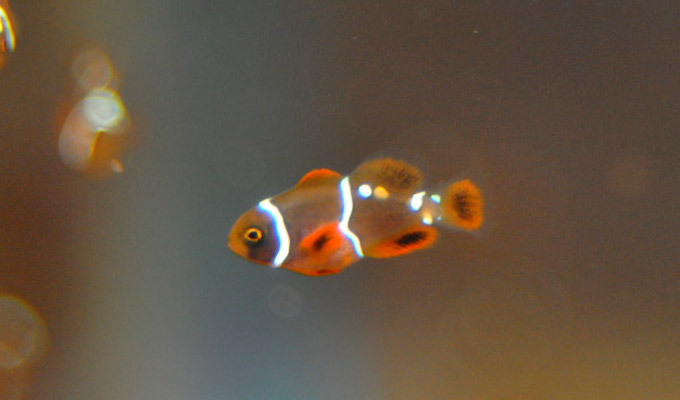 Yeah, I’m talking about the insane Black Ice Clownfish fad that’s going on right now, where no one can get enough. Nevermind that the Black Ice is a hybrid, and that it’s really not that far off from a Picasso Perc (which as it turned out is a naturally occurring variation), but I suppose it goes to show how fickle people’s tastes really can be, and perhaps how uninformed consumers really are. Of course, how many hundreds of Black Ice are sold each month here in the US? Compared to a possible 12 wild caught Horned Maroons per year? I think, if anything, a potentially restricted supply might suggest that the price of a “Horned” Maroon might in fact be much higher, at least in the current setting. Of course, there’s the notion that maroons are “evil”, and having had a lot of ‘em in the last few years, I think that’s overblown. 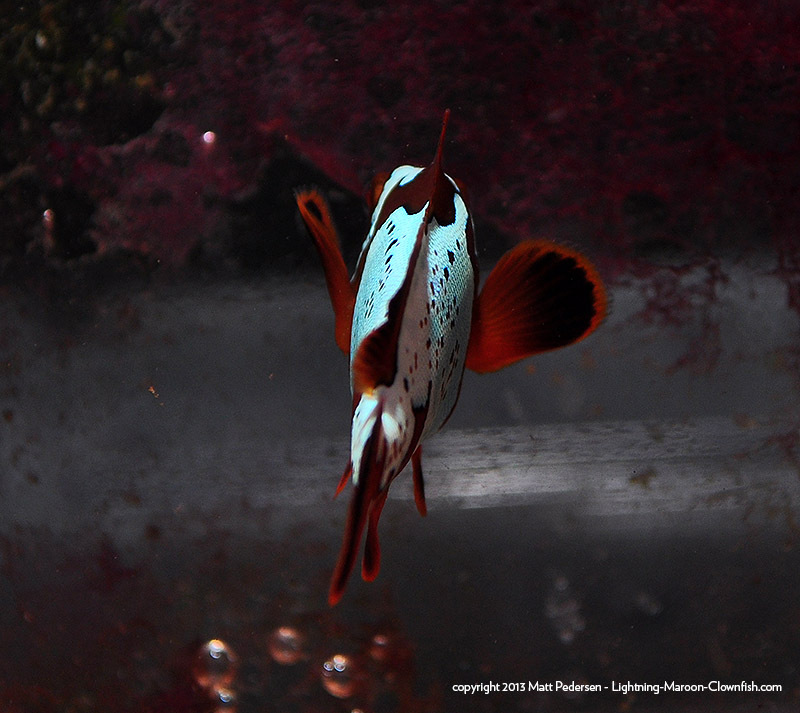 Most of my Maroons have shared tanks with other fish, and not one has killed a fish it was housed with. Hardly the murderous tyrants some folks make them out to be. All of this now brings me back to the bucket full of babies in my basement. 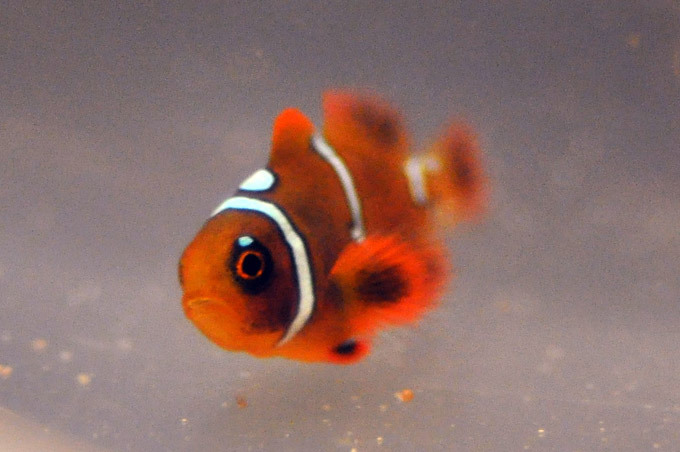 If we take the market prices from wild caught fish and ignore everything else, it’s reasonable to assume that a small F1 baby that is 100% normally barred should fetch at least $40. 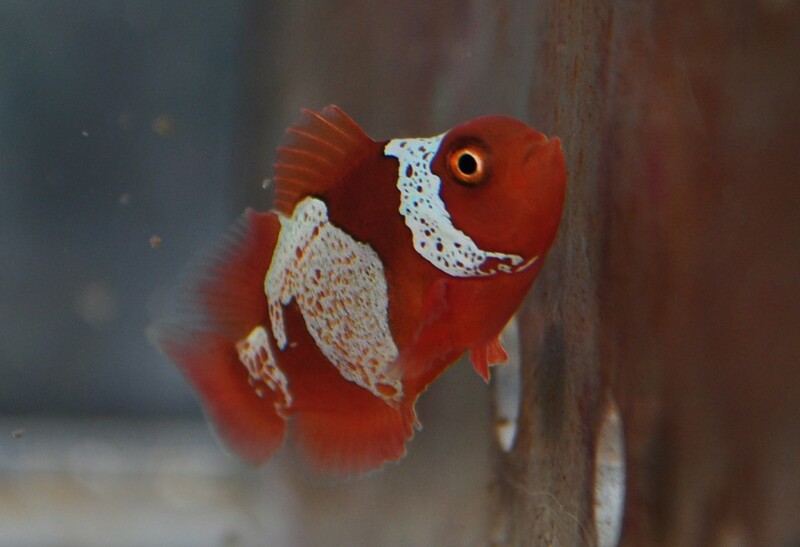 A baby showing some extra markings? Well, that right there could represent a fish valued at $150 or more. Definitely, any babies showing up with “Horns” wouldn’t sell for less than $150-$200. Really funky ones? Maybe they’re going to fetch $300-$500 a shot? What I can’t tell you yet is how much a 33-38% chance of the babies carrying Lightning genetics ads to the price of a non-lightning baby. 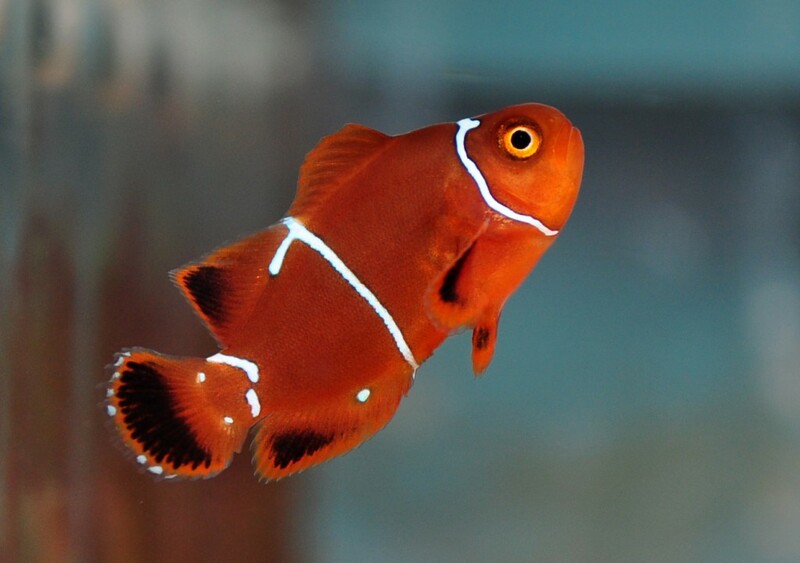 In a subsequent installment, we’ll talk about Lightning Maroon pricing, and how a hypothetical third wild-caught Lightning Maroon Clownfish might be handled and priced, straight from Dan Navin, director of EcoAquariums PNG. “Oh snap, was that thunder? 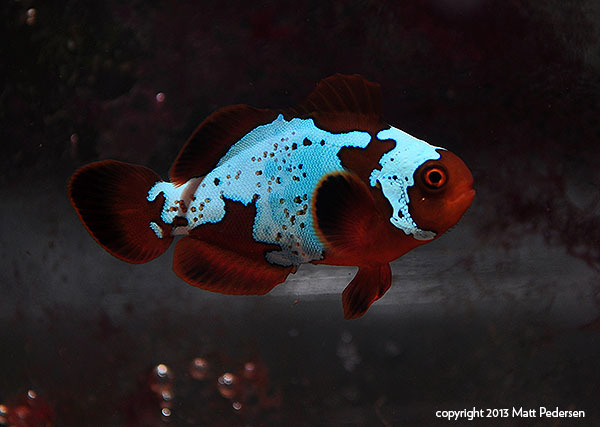 ?” – image courtesy EcoAquariums PNG, Ltd.
EcoAquariums PNG, Ltd, the successor of the spot formerly filled by SEASMART, has continued to turn up abberantly patterned Maroon Clownfish collected in the waters of Papua New Guinea. 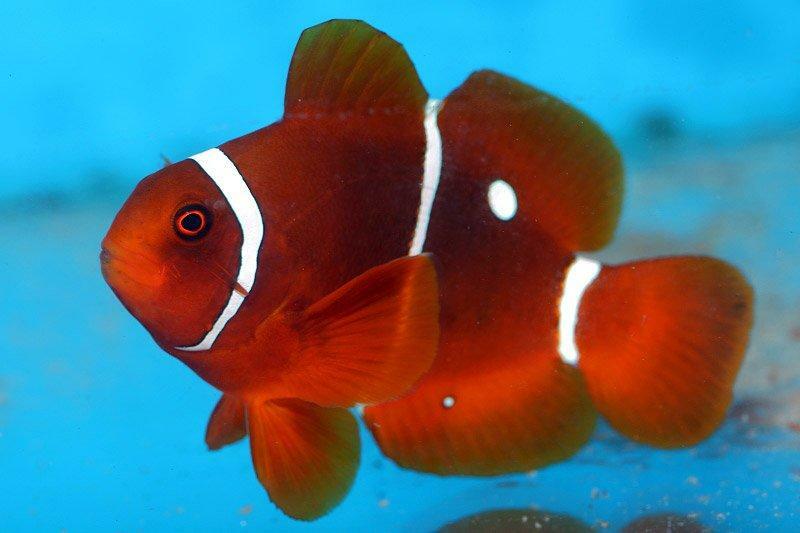 Between SEASMART’s own collections, and with no less than 3 unique Maroons shown off on the EcoAquariums PNG Facebook page this year, we are looking at the very least, well over a half-dozen PNG-sourced Maroon clowns that are highly “atypical”. 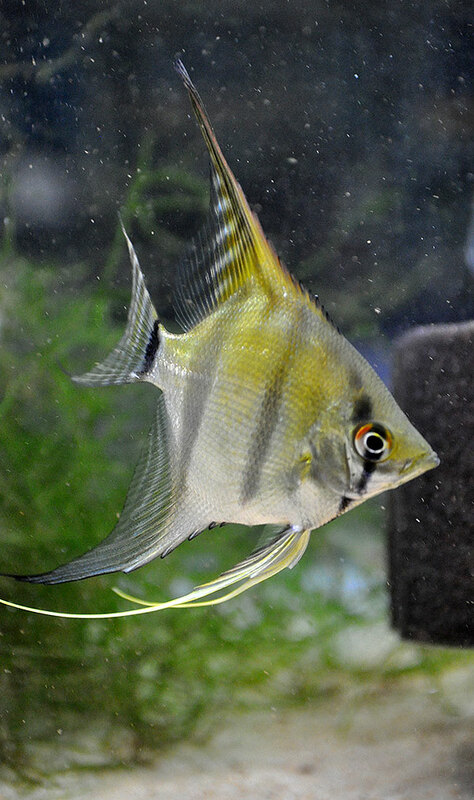 SEASMART referred to many fish like these as “Horned” Maroons, owing to the common barring pattern of “prongs” leading off the headstripes in either direction. 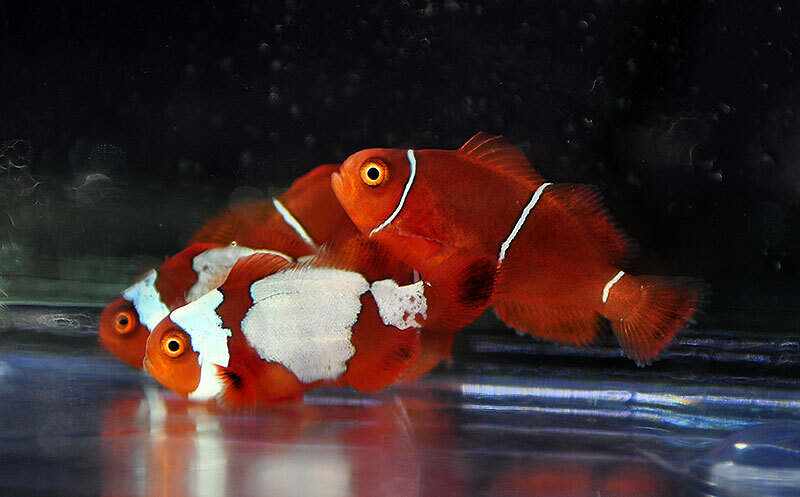 It’s a unique fish, but digging deeper, there’s even more information behind these unique maroon clownfish. 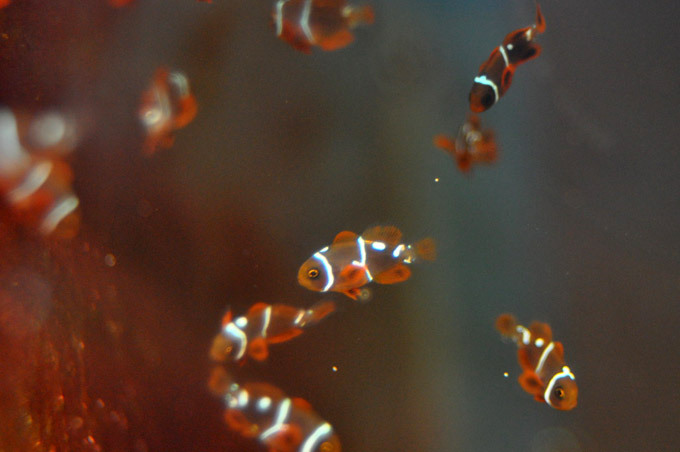 Total Percula Clownfish harvested by EcoAquariums PNG to date = 3474 = roughly 35.7% of total exports. 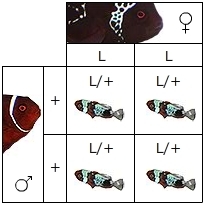 I share the Percula figures because a) they surprised me and b) it kind of speaks towards the general overall demand for Amphiprion percula, vs. Premnas biaculeatus, in the trade. 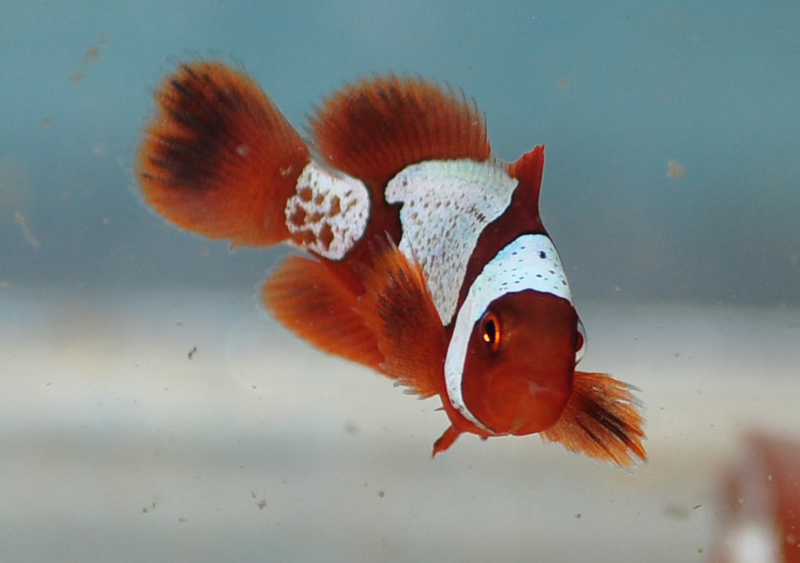 The other interesting part – the data as currently provided by EcoAquariums PNG Ltd. is an unprecedented look at what is presumed to be the entire marine aquarium life trade in Papua New Guinae, and could someday form the basis for a lot of interesting research by academics. It’s an amazing data set, assuming the accuracy is there (which, in theory, it should be). 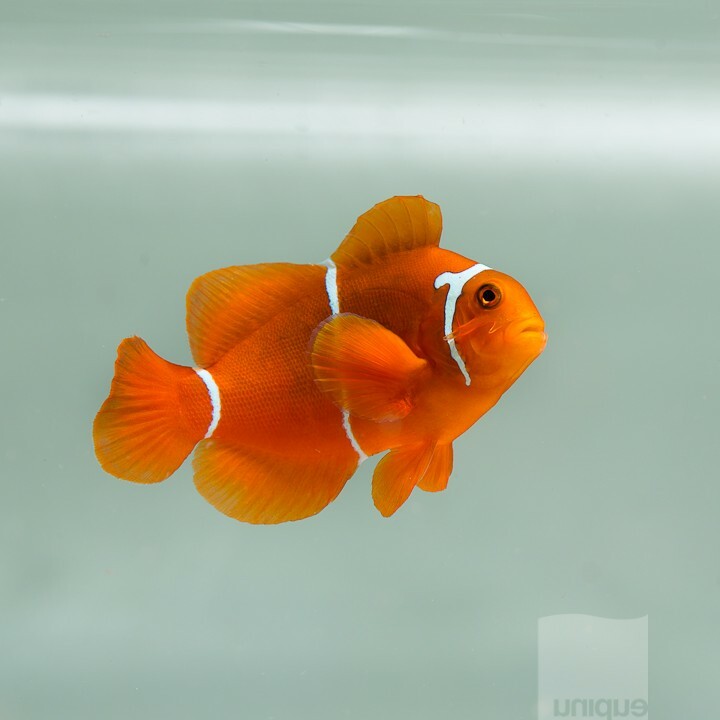 The transparency provided gives us an unparalleled opportunity to question our supplier, and at the same time, investigate some really interesting questions on our own. 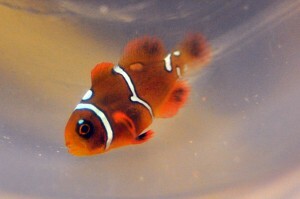 Currently, the data runs from November 22nd ,2011, through July 5th,2012, and covers 9,723 fish and inverts. 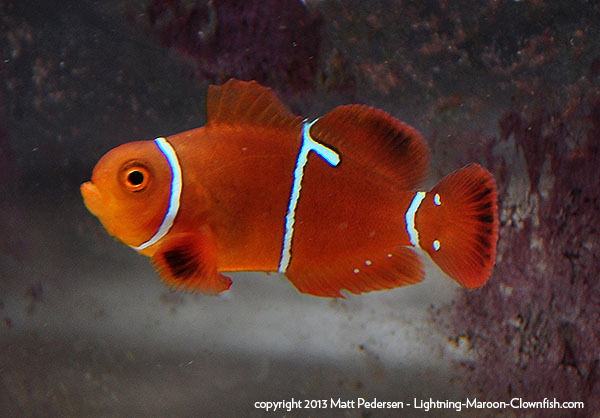 Out of those fish, there were 165 Maroon Clowns collected. 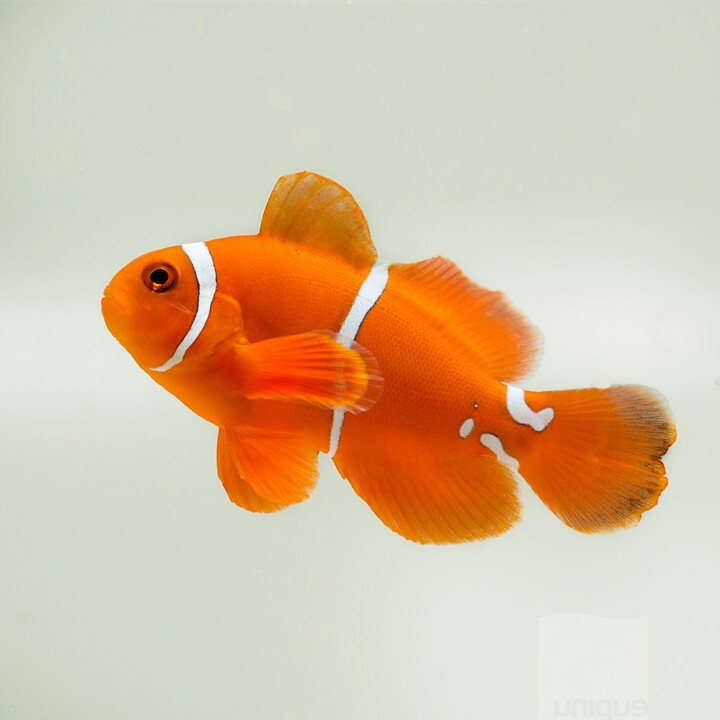 Out of those Maroon Clowns clowns, 22 were flagged as ‘unique’ in some fashion, with two three of those twenty-two being further classified as “highly” unique. 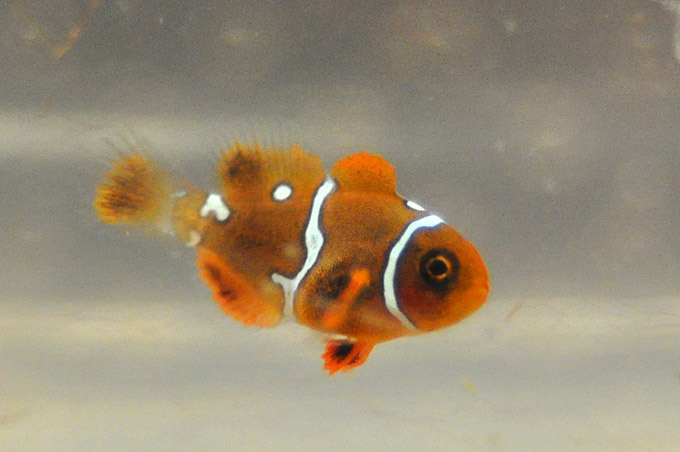 There are so many interesting ways to look at this – we cover 226 days in this sampling, which means at current catch efforts, 7 out of every 10 days, a maroon clownfish is caught. 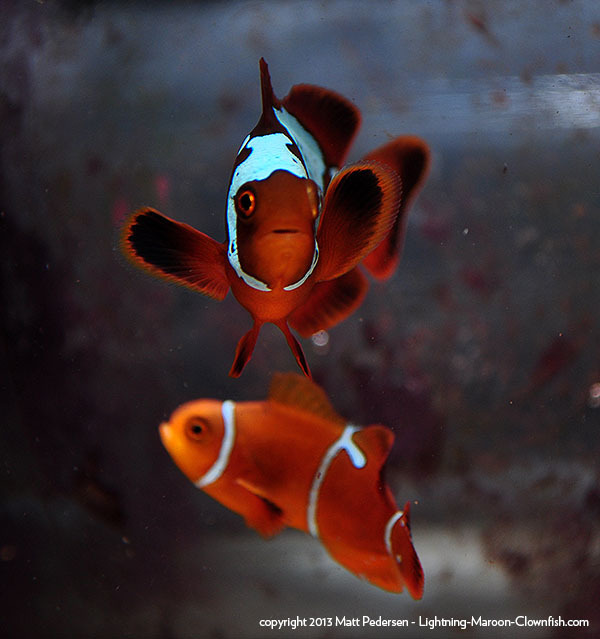 Slightly over 14% of the collected maroons are classified as unique in some capacity, and odds are, roughly every 11 days, a “unique” maroon is collected by the folks diving in PNG (just under 3 per month). Obviously, we cannot extrapolate this to necessarily say that 14% of the maroons found in PNG waters are “abnormal”…without a doubt there is possibly, if not probably, a mandate and emphasis placed on unusual maroons, that is to say “even if we don’t need maroons right now, if you see something atypical, you should collect it”. When I originally drafted this article, I had a lot of “genetics” on my mind. While I think we will have better answers, here’s where my thinking was last month. 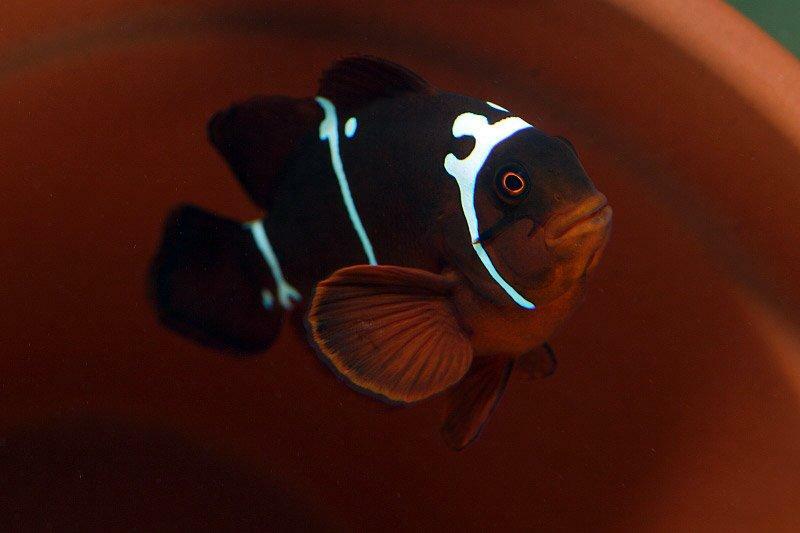 Clearly, deviations from the normal striping seem to be prevalent in PNG waters where EcoAquariums operates. 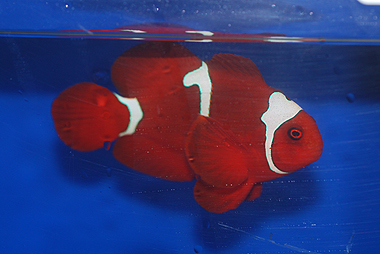 And looking back at all this, and how we’ve come to learn that Picasso Percs are not necessarily as exceedingly rare as we may have initially thought, this does all start to make you wonder – in these aberrant wild maroon clowns, are we seeing a low level occurance of the equivalent of “picasso” type forms in a wild population in PNG? Could it in fact be that these “close but no cigar”, highly unique maroons, may in fact be the picasso equivalent or as one blogger put it, a “Lightning Precursor“? 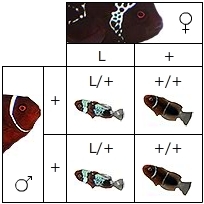 And, if the genetics of Lightning were to work like we think the genetics work in Picassos , could it be that the two fish we’ve called “Lightning” to date, may in fact be the equivalent of the Plantinum Perc? 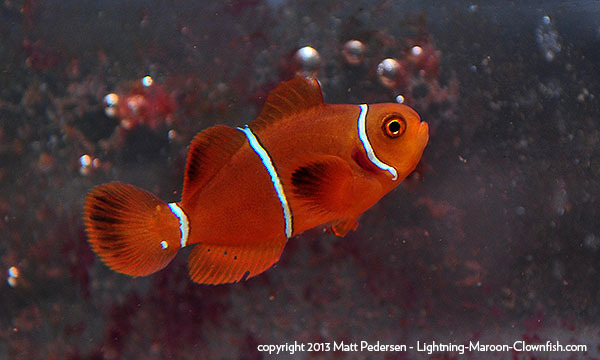 And here’s the kicker…the fish above does show traits that certainly speak to it being “lightning-esque”. 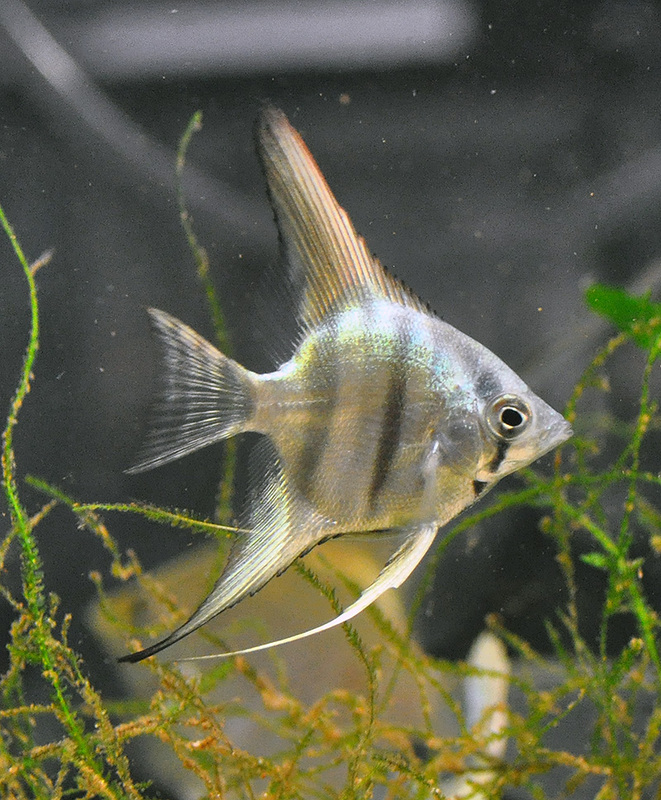 But when I look at the two fish we’ve called “Lightning” to date, here’s what I see – more of a netting effect, particularly in the headstripe but also in the midstripe and tail stripe. 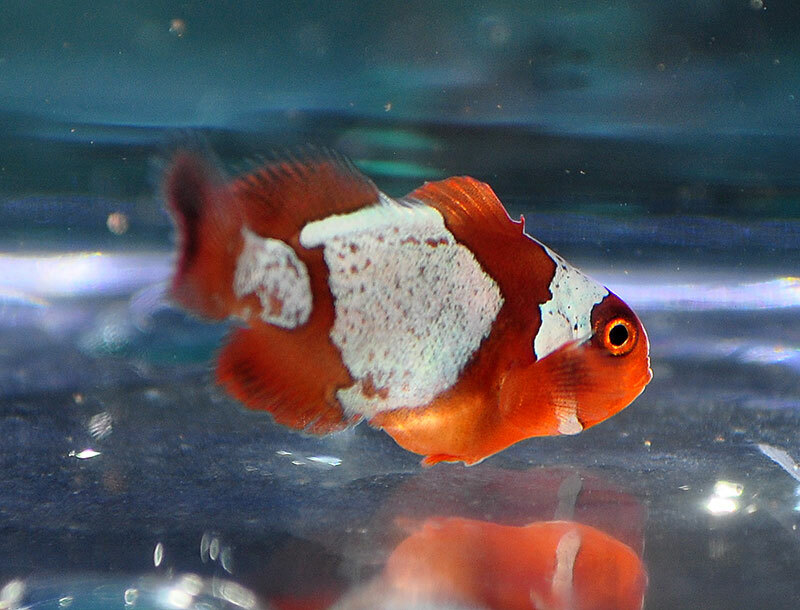 Let’s ignore my Lightning Maroon (#2) and go back and look at #1 - http://reefbuilders.com/2008/09/21/wicked-maroon-clownfish-emerges-from-the-png/ - and here’s where my thinking goes. 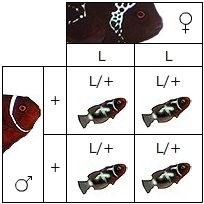 If you double up, and mate these “close but no cigar” unique or aberrant Maroons, do you get a redoubling of the gene that causes the stripe abnormality, taking the phenotype from stray prongs, spots, and splits, and amplifying it into the “Lightning” form we all know and love? 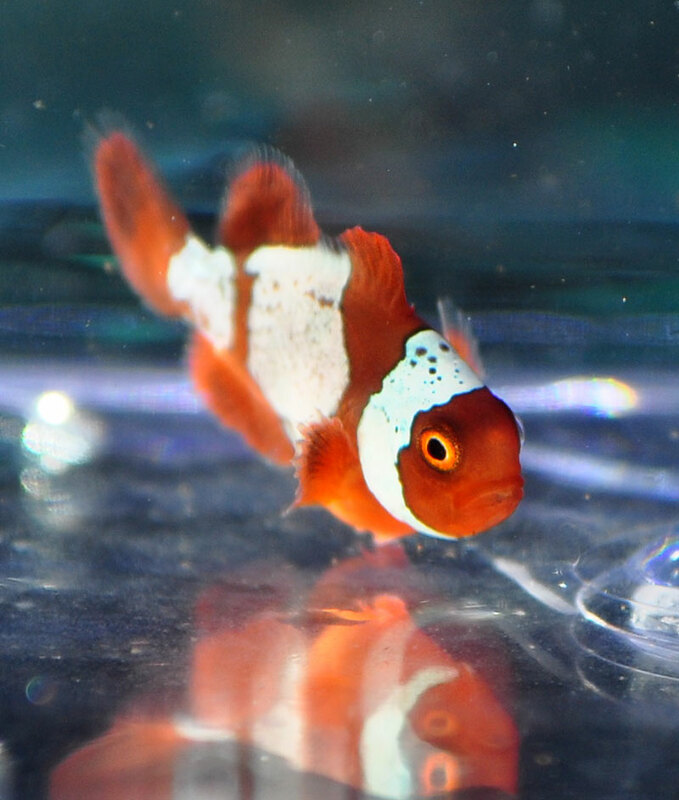 It may sound insane, but there are definitely examples of this genetic story in other fish, including clownfish such as Picasso Perculas which appears to be a “single dose” of a dominant gene, and Platinums being a “double dose” of that same gene. It may or may not be that way, but further offspring counts should nail it down, and some breeders may already know the answer and just aren’t sharing / thinking it’s worthwhile to mention. 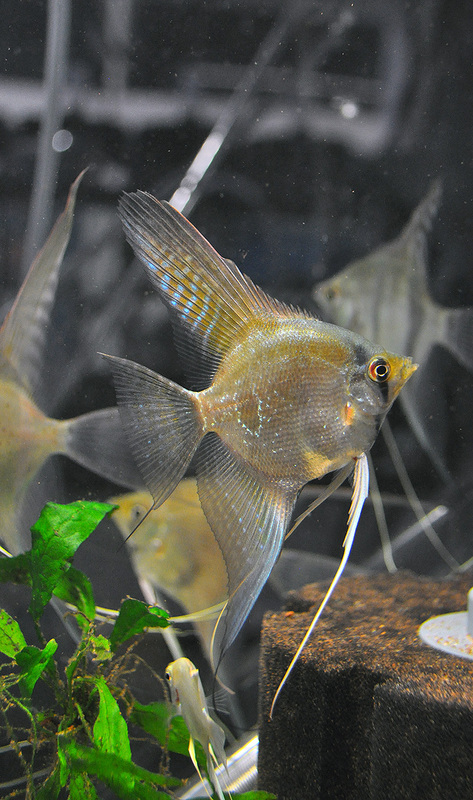 Of course, as I recently learned, there is not shortage of genetic understanding in other fish where different genetic loci and the alleles at those loci are known to drive a plethora of diverse phenotypes – amazing levels of information exist for freshwater Angelfish (Pterophyllum scalare) via the Angelfish Society’s genetic documentation and others (such as a release about the Philippine Blue locus made by a collaboration of parties independent of the Angelfish Society). We can only hope that those breeders working on designer breeding start paying greater attention, and can realize the value presented here by sharing information. 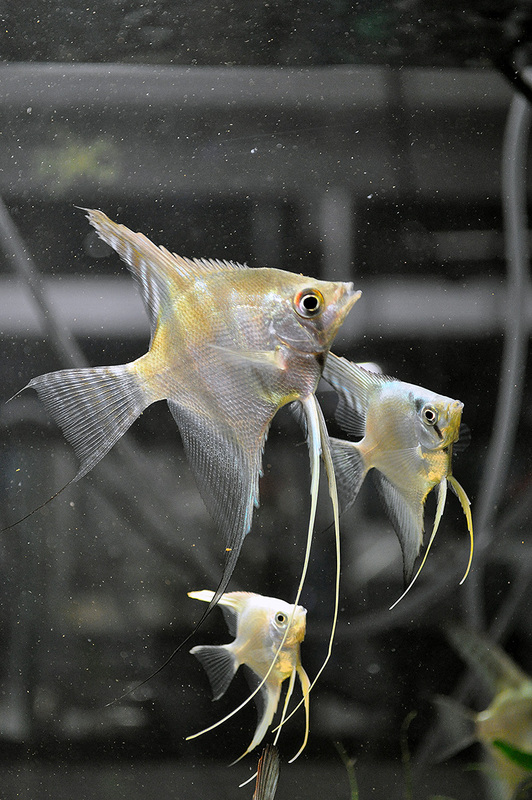 The level of breeding CONTROL one is afforded has elevated the discourse and pursuit of Angelfish breeding in my opinion. 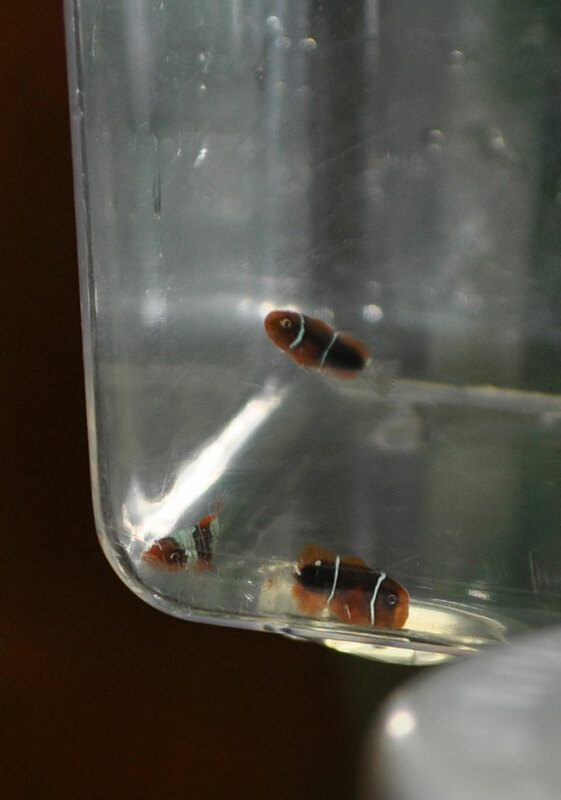 Turning back to the Lightning Maroon genetic mystery, my original hypothesis about the wild-caught “horned” type Maroons from PNG was all speculation at that point, and when the ideas came to me and I first wrote them down, I had yet to see any baby Maroons from our Lighting breeding efforts. Despite that data deficiency, we’re certainly seeing a continuum of stripe aberrations in these fish that were perhaps suggestive of a genetic basis (given the geographic restriction and frequency of occurrence). Granted, now that we have babies, the story is about to get a heck of a lot more complex….and yet, possibly much clearer. 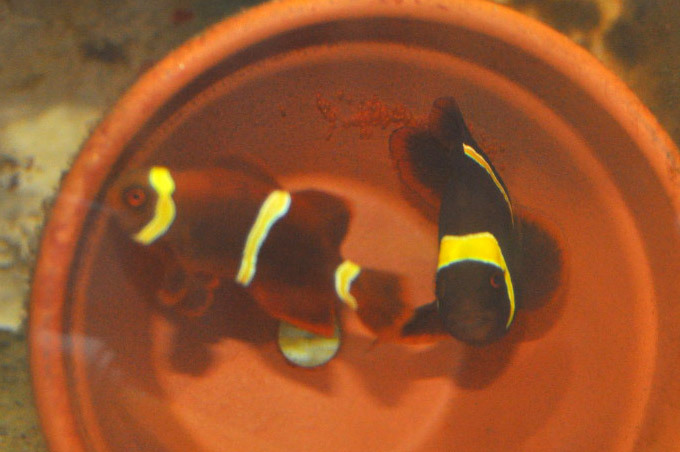 Mike Hoang’s Funky Gold Stripe Maroons – what’s in a name? 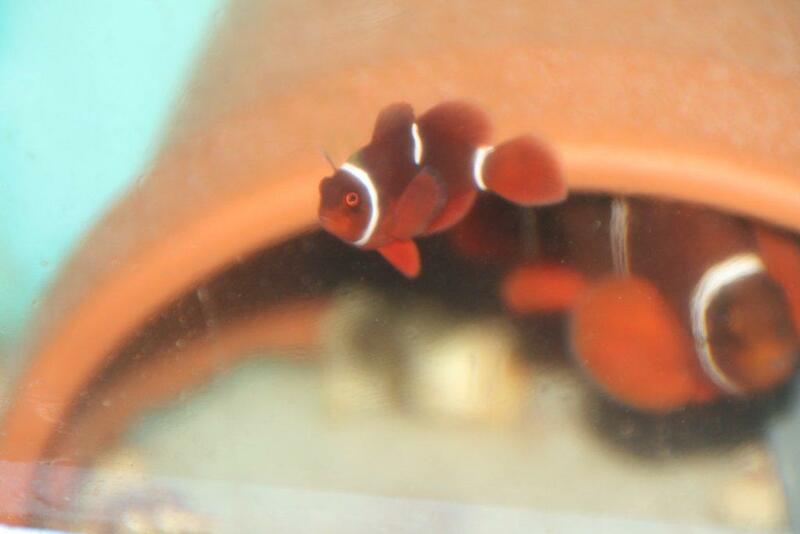 Mike Hoang’s new Goldstripe Maroon Babies were announced moments ago on ReefBuilders. 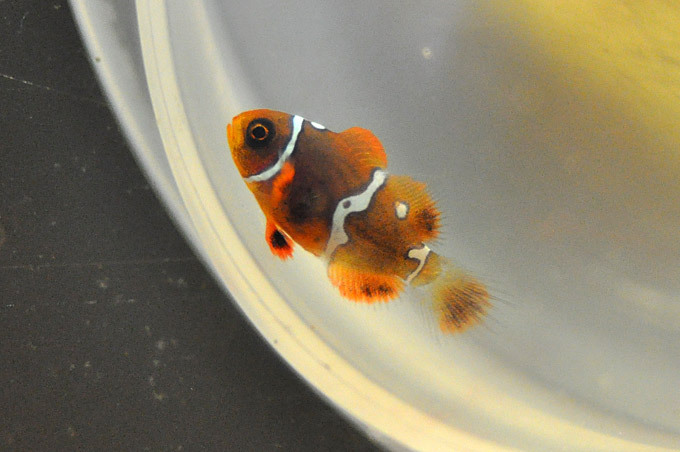 It’s hard to say how excited I was when I stumbled across these baby Goldstripe Maroon Clownfish being turned out by Mike Hoang. 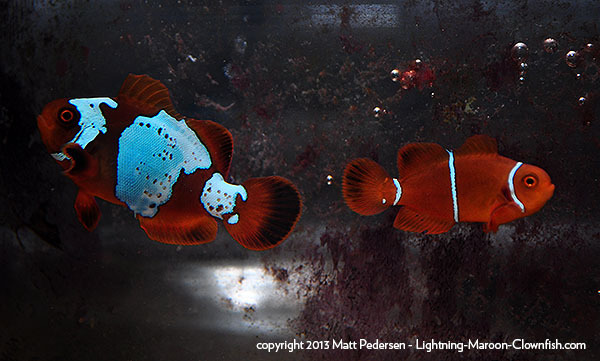 I saw them and wondered…if you breed two of these together, will you get Gold Stripe Lightning Maroons? 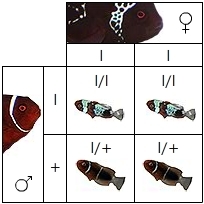 Of course, it might be very premature to discuss breeding outcomes given that we don’t even know if there’s a genetic component here. 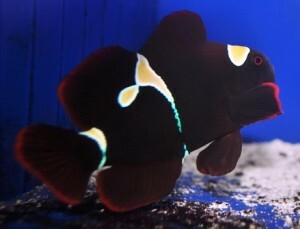 However, there’s been no shortage of discussion around what these fish should be called? 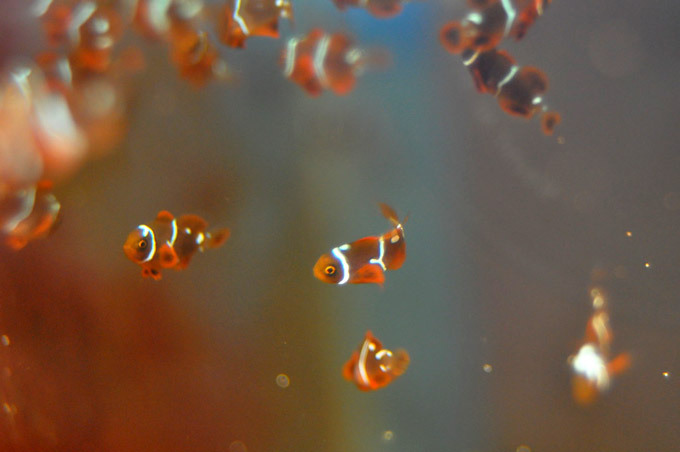 And yes, just to be clear – no photoshop here – the video of the babies at 3.5 weeks post hatch proves it! 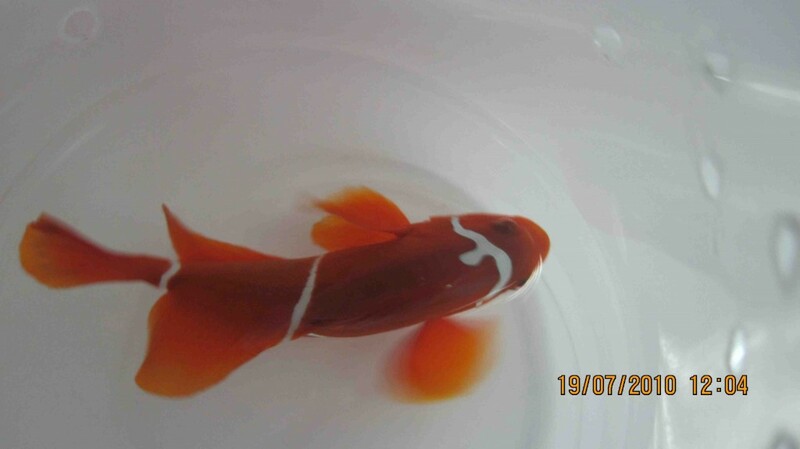 Initial reports called the fish Teardrop Maroons. 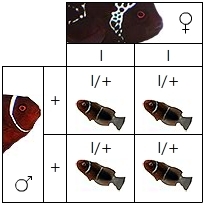 Arguably you could say I pursuaded (bullied) Mike away from this name given the prior use of it to describe a common pattern in misbarred Ocellaris Clownfish (not genetic). Mike joked online that maybe they should be called Picasso Maroons. Perhaps a fitting name in my opinion. 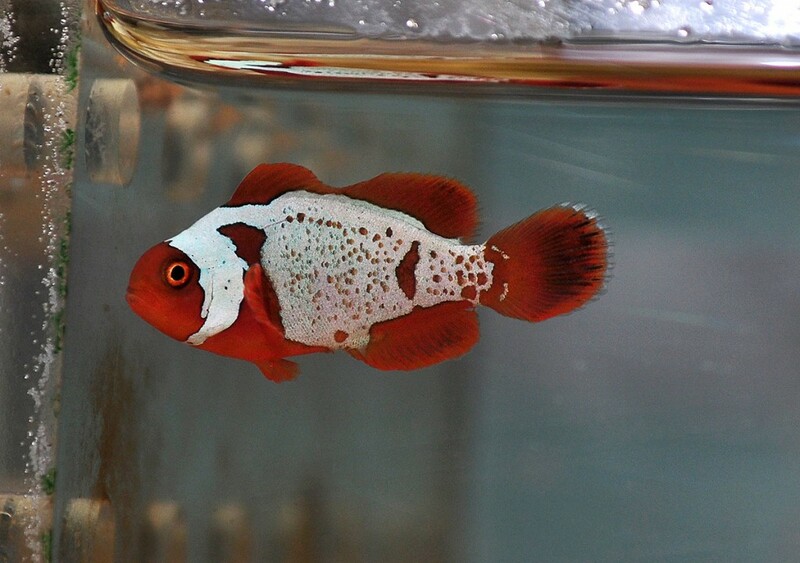 However, after futher consideration, I would argue that the somewhat Piebald Maroons show off by ORA at the 2010 MACNA are more fitting and similar to the barring pattern displayed by a Picasso Perc, and thus, maybe Picasso might be a good name for that variation. 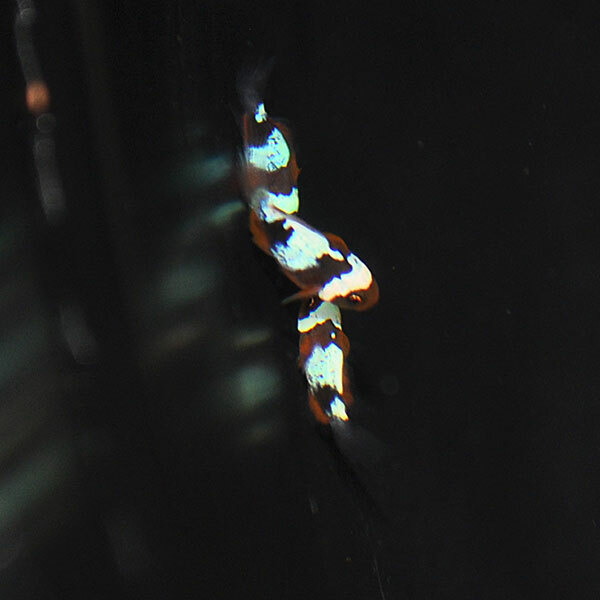 Mike’s baby Maroon Clowns truly look somewhat like the spotted Amphiprion bicinctus that ORA produces and calls Spotcinctus, a variation that seems to have repeated itself in the fish called the Picasso Clarki Clownfish. 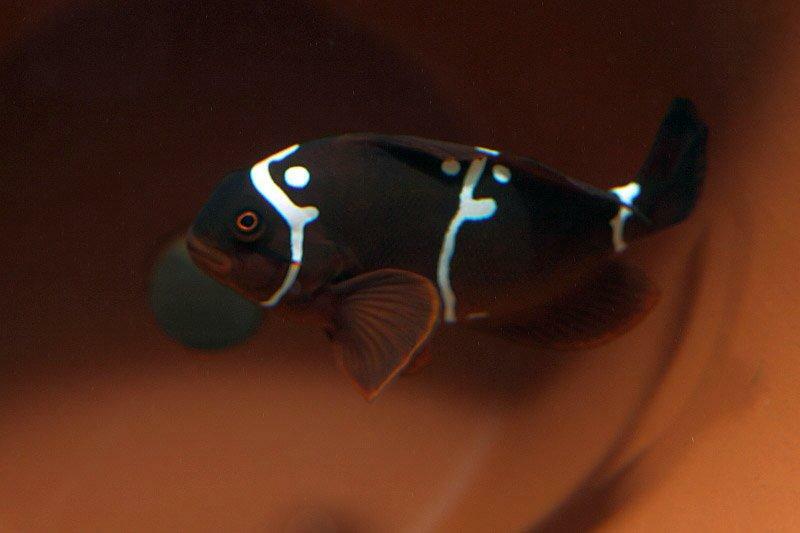 Heck, just this morning (9-20-2011), Mike sent photos of a baby he discovered in this batch showing what we’d call a “Pearl Eye” mutation, and this patterning is seen in many of the Spocinctus and Picasso Clarkii. 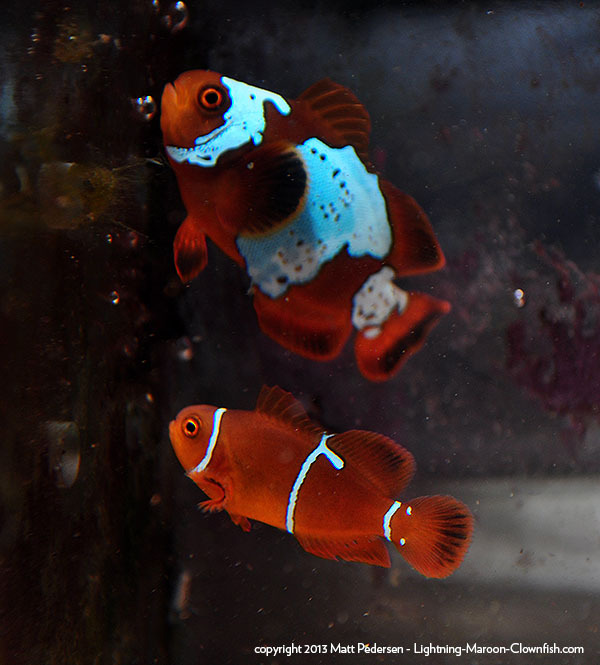 Similar variations in Maroon Clownfish barring and striping have appeared before from Sustainable Aquatics (SA) and also from wild fish that have been called Horned Maroon Clownfish by SEASMART (the Horned Maroons lacked spotting). If SA already gave their variants a name, it could take priority over anything Mike could want to call them if they’re the same thing. 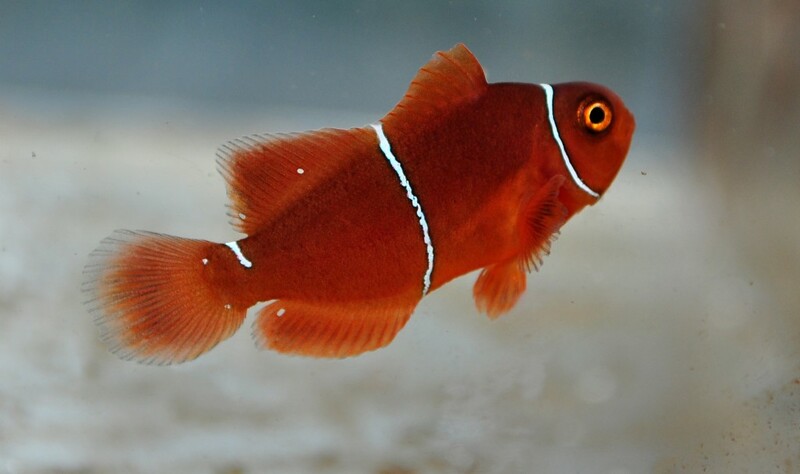 While waiting to hear back from Sustainable Aquatics, Mike and I discussed the issue of naming, and after some back and forth, in trying to pick something unique, I proffered “it’s a Maroon, right? We have a Lightning Maroon. 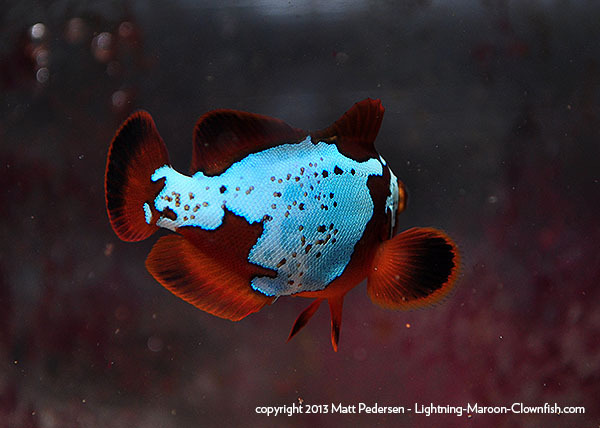 What about a Hailstorm or Raindrops Maroon?” Mike’s final answer, and a tentative name – Thunder Maroons. Unique and different with a bit of whimsy. 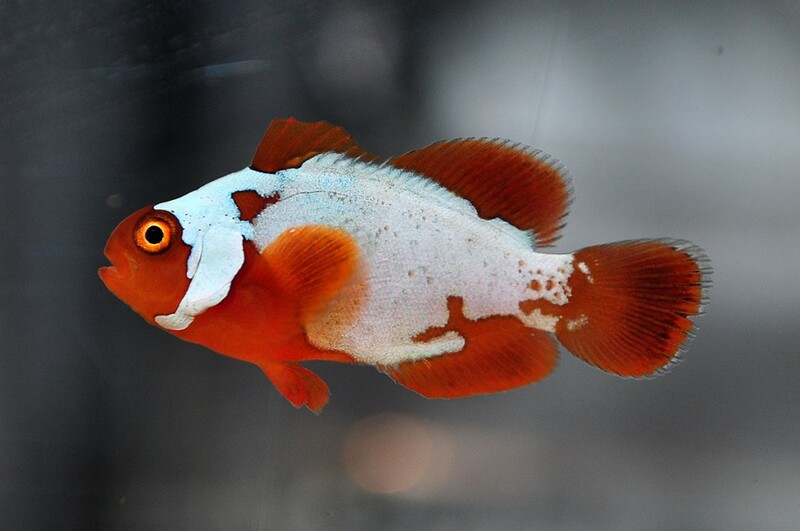 Of course, the discussion continued once we had Matt Carberry of Sustainable Aquatics get back to us – indeed, there was a prior name that SA applied to fish with this phenotype (appearance) -Goldflake Maroons. Matt elaborated on their work with the Goldflake Maroons, writing, “We have seen some aberrant maroons show-up occasionally. The oldest pictures I can find are late 2007; I’m sure that most breeders of maroons on any scale have noticed some of these types of markings. 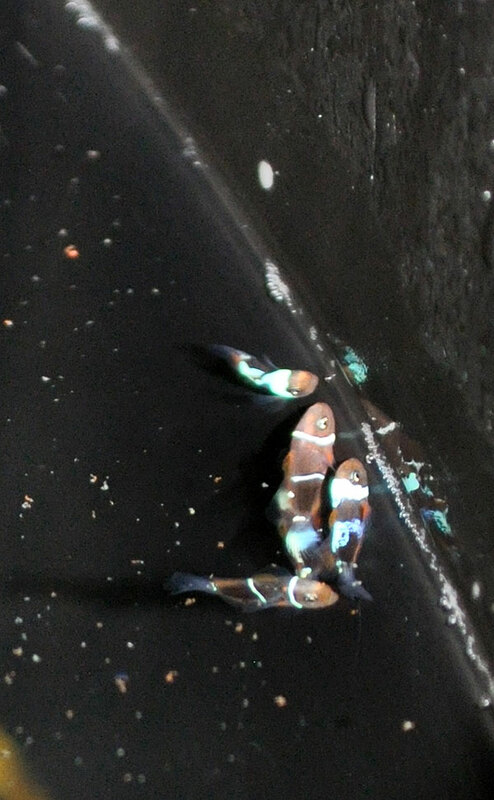 It isn’t extremely common, but we regularly find them in hatches from multiple spawning pairs.” Matt went on to elaborate some initial genetic findings, relaying that they “formed a pair from these, but their offspring have produced only normal maroons (working on the next generation might yield something, but we haven’t explored that). 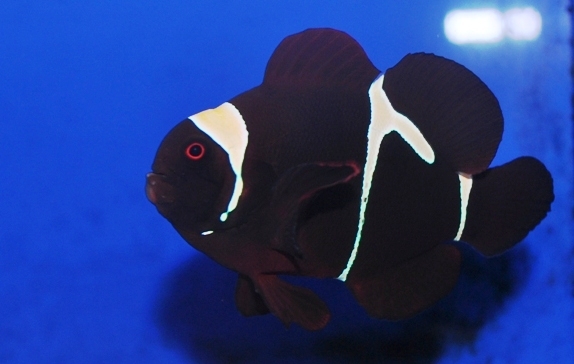 It might be similar to the clarkii pearl-eye or more recent picasso-esque mutation. 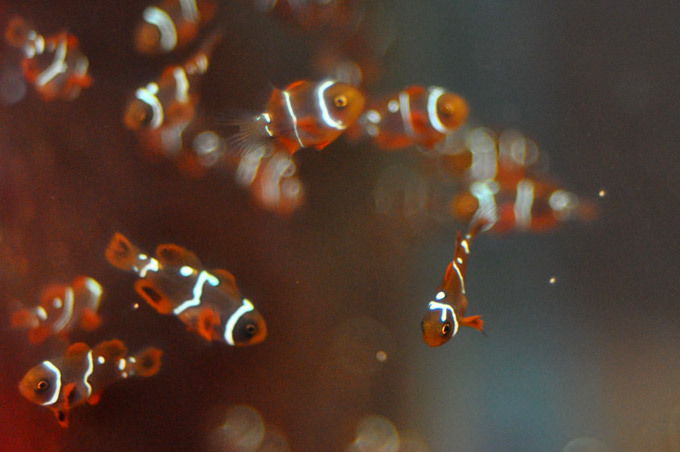 We have formed pairs of pearl-eye clarkii, but their offspring are no different from normal parents. It seems to be something that happens during larval development.” So the jury is out. I am the first here to say that this situation has me perplexed. 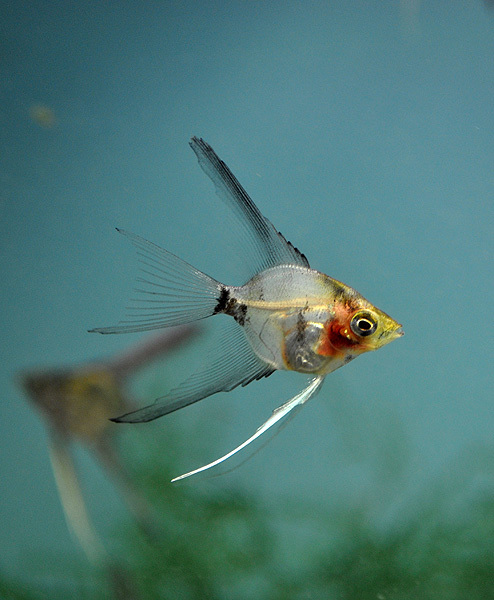 In comparing the “SA Goldflakes” to Mike’s new babies, it is clear that they are similar, but that Mike’s offspring are a more extreme form of the aberration, with more spotting, more irregular and split barring. Mike and I both see the merits of calling his offspring “Hoang Goldflake” – a nod to the preexisting name for what currently appears to be the same basic variation in the same species and a continuation of a process becoming well-entrenched in marine fish breeding (Booyah’s Onyx, Rod’s Onyx, C-Quest Onyx…see the pattern?). So that makes sense for the moment. Of course, is it perhaps premature to discuss a name at all? Personally think the name should tentatively stand as Hoang Goldflake until we either see that this is clearly different from the SA Goldflakes, or if we learn this form of misbarring is caused by the rearing conditions and not genetics (in which case these may simply be classified as “ovebarred” vs. “misbarred”). 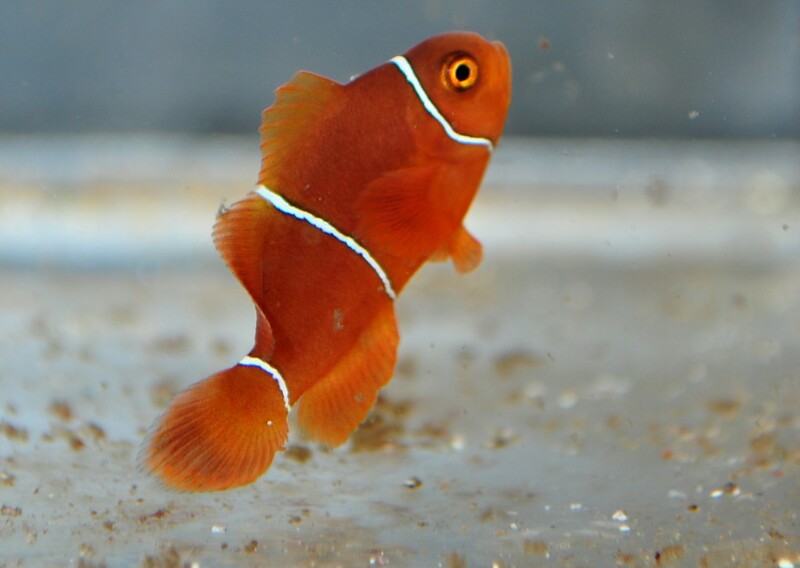 If in fact Mike’s fish prove to be genetic, or continue to develop a much more extreme variation, it might be very fair to call these fish Goldstripe “Thunder” Maroon afterall, in this case owing to the distinctiveness of the form and being the first proven genetic. 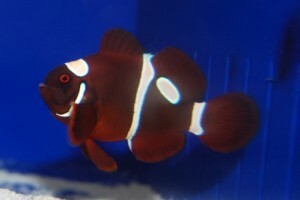 But then again, we could very well be looking at simply something analogous to the various gradiations of the Picasso mutation in Percula Clownfish, where we acknowlege they are all Picassos, and show varying levels of misbarring and overbarring across the population that go further and further from the norm. 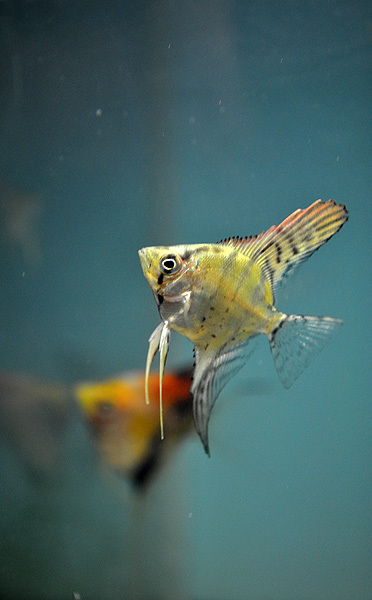 In that case, perhaps Hoang’s Goldflakes represent more “A Grade” Goldflakes vs. the “B Grade” Goldflakes originated, named, and shown in some of Sustainable Aquatic’s earlier images. 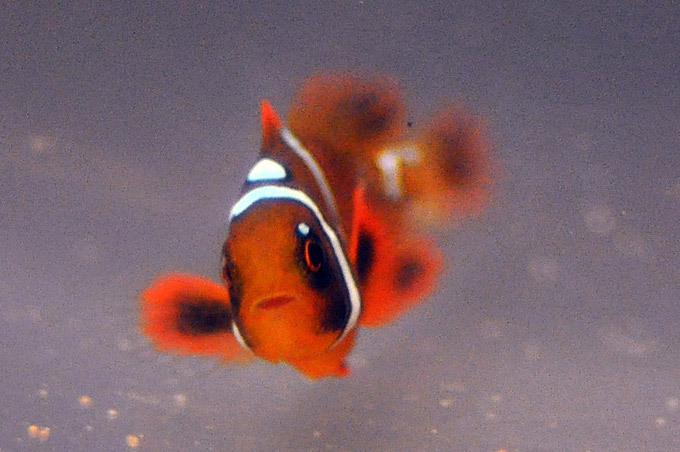 My personal opinion – if I was to guess how baby Lightning Maroons might look at this age, I’d say Mike’s fish would match my imagination. Seriously – look at that midstripe above…it looks as if the stripe is starting to split and have a dark area in the middle. Take another look at this particular baby from the other side. Could Mike be sitting on a goldmine of baby Gold Stripe Lightning Maroons? 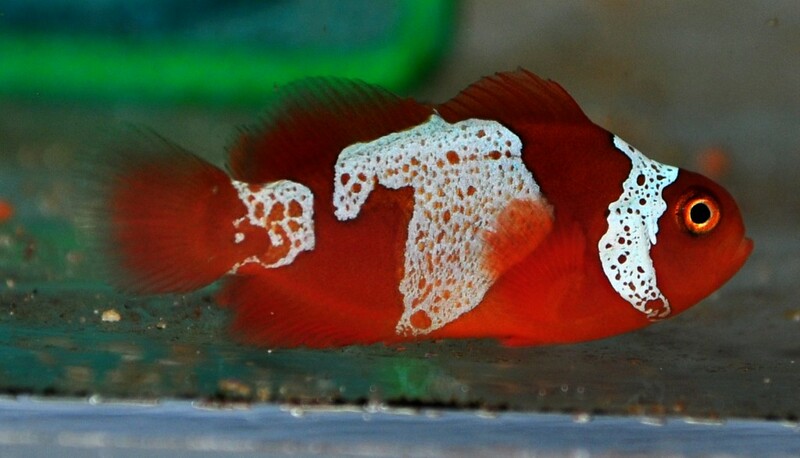 This is a short post – Mark Martin showed me this fish last night, I passed on the premise that if it’s genetic, it seems to be a bit more like a “Picasso” type variant than the “Lightning” variation. I really think that there is a running theme here. 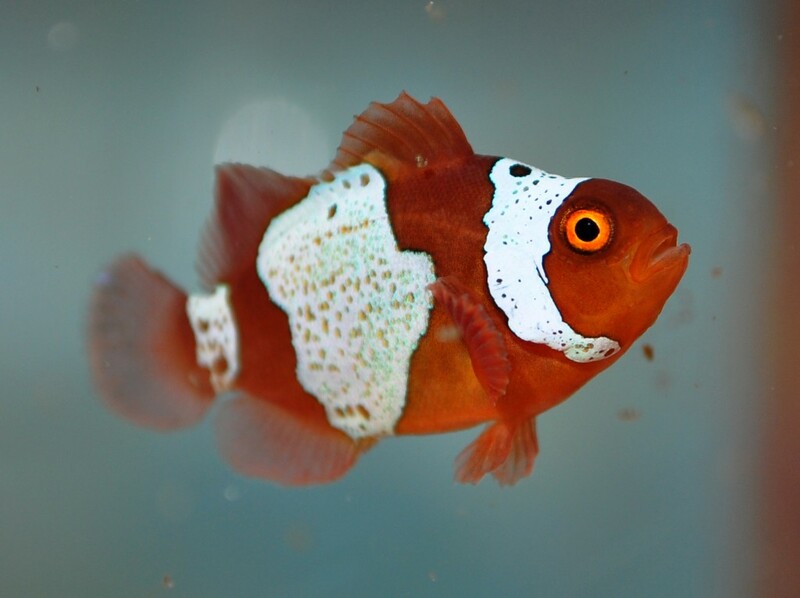 It’s juts a theory, but it would seem that the same basic “overbarring” mutation, called “Picasso” in Perculas and “Snowflake” in Ocellaris, is also showing up in Maroon Clownfish now. 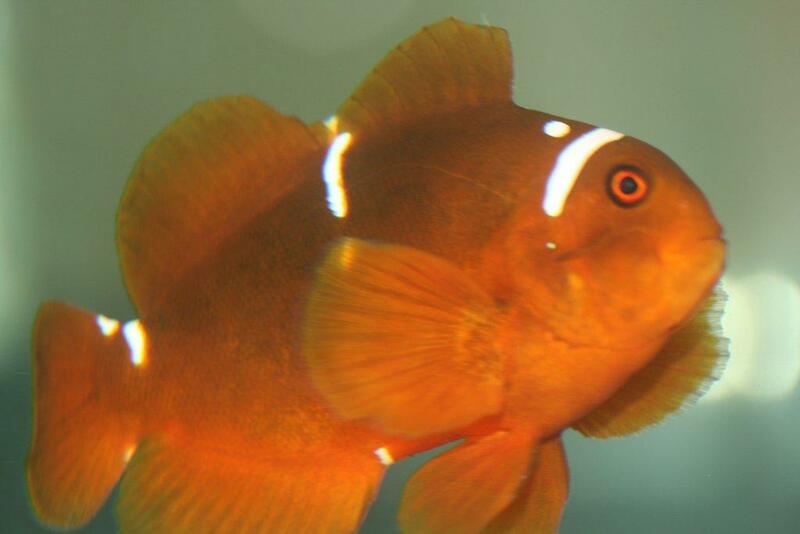 It would make sense that the genetic of the stripes are all pretty similar among clownfish, and thus, an aberration in a single gene could create the same basic mutation and expression of that mutation across individual clownfish species. 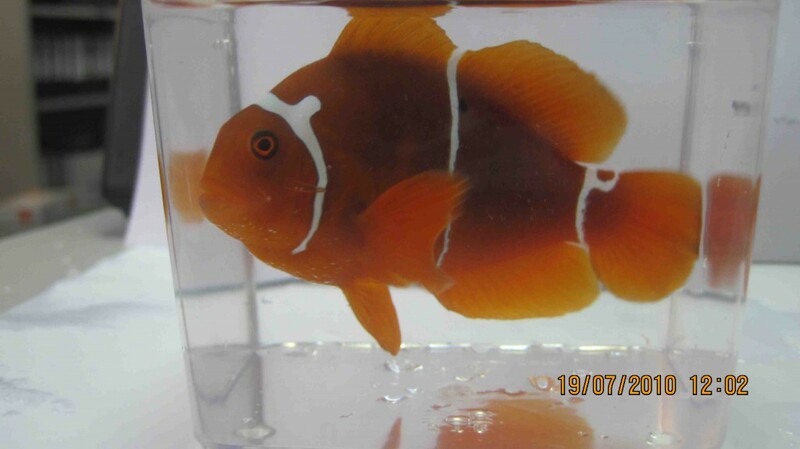 Now, we do know that Maroon Clowns are notrious for stripe abnormalities in cultivation anyway, so it’s definitely hard to say what is genetic and what is not. 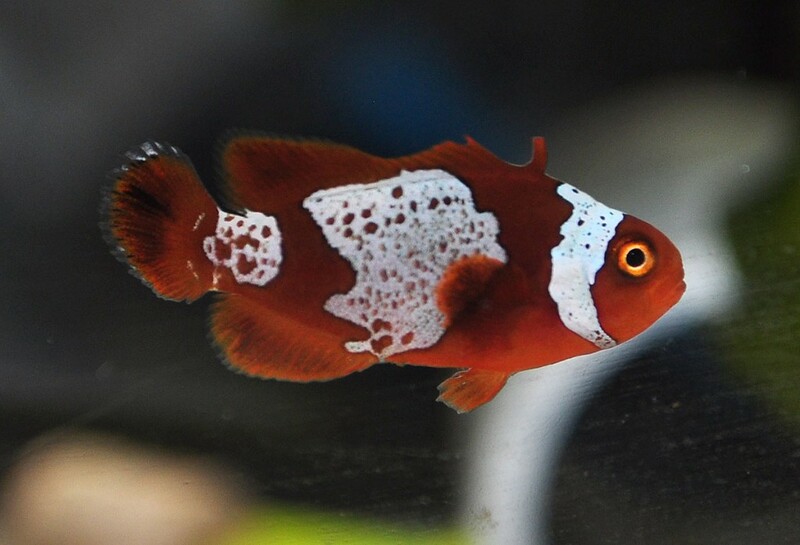 There are more funky maroons like this coming out of PNG via SEASMART…everyone should remember the “Morse Code” Maroon I tried but lost to disease (mouth rot). 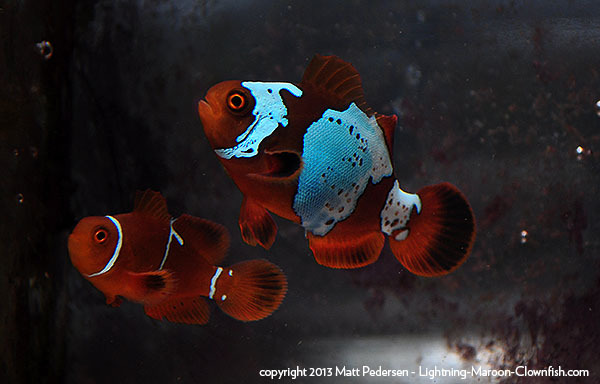 Mark Schreffler sent me some other great pics of fish they’re calling “Horned” Maroons…any of these could carry the secret to unlocking the Lighting Maroon mutation. I’ll update this same post with images if/when I have the proper blessings from their authors! Stay tuned…. And here they are! All images below are copyright 2010 SEASMART, and may not be reused or reproduced in any fashion without the written consent of SEASMART! 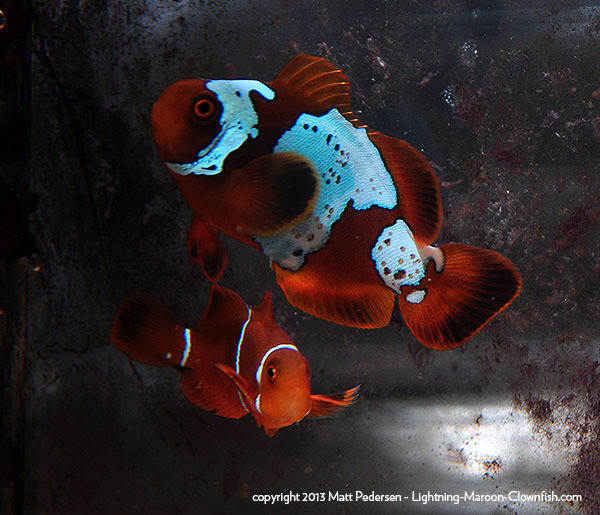 Thanks again to Mark Schreffler & SEASMART for allowing me to share these images with the readers of The Lightning Project!